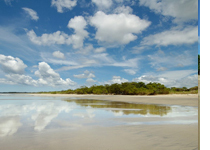 Written by Travel Excellence Another beautiful beach in Guanacaste is Avellana Beach. It is 16 kilometers (10 miles) south from the popular Tamarindo, very close to Junquillal Beach. It is a quiet beach with great swells and world-class surfing, often looked by professional surfers and enthusiasts from all over the world. If you are coming to a Costa Rica vacations and are wondering about places to visit in Costa Rica, I will recommend you Guanacaste, in the North Pacific Coast. Guanacaste has to be on your list if you are planning a Costa Rica surfing trip or a Costa Rica family tour, since there are many amazing beaches to visit, separated by short distances and with several National Parks and Wildlife Reserves in the middle. Avellana is a secluded beach, neighboring with Playa Negra (Black Beach). It is very quiet during all the year, due to the dirt; unpaved roads leading to it that make it inaccessible during the rainy season. For surfers, Avellana offers a world-class surfing experience, with at least eight surf breaks over the shoreline that extends for two kilometers. Since the currents tend to be strong I will recommend it for experienced surfers, and it’s not apt for swimming. But when you find a high tide to ride, it will be an exciting experience, no less than that. Besides surfing, you can practice other activities at Avellana, like relaxing and sunbathing, horseback riding across the beach, or hitting the club located near the beach to have a few drinks and food. You will find some cheap Costa Rica hotels, but if you look for something fancier, you can stay at the exclusive Hacienda Pinilla luxury resort, with one of the best 18-hole golf courses in Central America. You can get to Avellana from Tamarindo or Santa Cruz.